In October 1968, Lyndon Johnson was president, the Beatles released Hey Jude, and computer scientist Douglas Engelbart presented the "Mother of All Demos." It was also the year tire-making giant Bridgestone Corp. opened a data center in Akron, Ohio. If walls could talk, this data center could tell the story of IT. That center opened on Oct. 9, 1968, with racks and racks of tapes and a water-cooled mainframe. Today, it is the home of systems supporting an almost completely virtualized environment. Bridgestone recently finished consolidating six data centers, totaling about 25,000 square feet, into one 10,000-square-foot facility. The project began in 2015 and cost $17.3 million. The renovated data center officially opened in April and its completion was as important to the community as it was to the company. The mayor of Akron was at the ribbon cutting. The facility employs about 80 IT workers. Bridgestone had run a "fairly decentralized" environment, in terms of management, processes and systems, said Rob Olds, Bridgestone's acting CIO. The company wanted the same standards, processes and governance across the enterprise, and a data center that "is a point of stability and confidence but also an enabler of the business," he said. But under the raised floor was history. There were water-cooling lines dating from the late 1960s and evidence of successive waves of technological change, mostly in the form of copper wiring. Physical servers were moved in and out of the data center over the decades, but the older, connecting tech under the floor wasn't all removed. 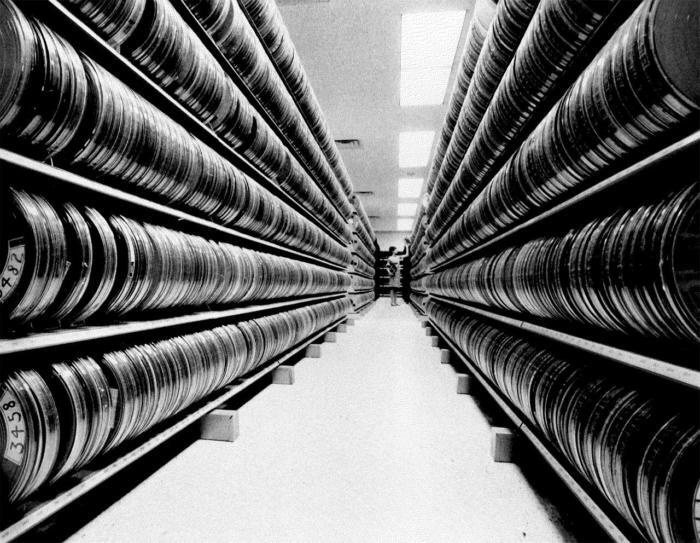 The Bridgestone data center in 1968, with racks and racks of tapes. "It was layers and layers of wiring as you would expect," said Mike Hartz, senior manager, IT Special Projects, who managed the renovation. The project went from wall to wall and included hauling out 26,000 pounds of copper wiring. The data center now has 67 miles of fiber-optic cabling. The near 50-year history of the place provides a benchmark for measuring change. In 1968, the data center had 8,500 miles of tape storing 1,986 gigabytes of data, or about 2 terabytes, an amount of data that can fit on a 2TB thumb drive. Today, the data center holds about 3.5 petabytes of data, said Bridgestone officials, or about 3.5 million GB. The shrinking of the data center is due to improvements in technology. Data center space in general is declining at enterprises due to technology advancements and use of the cloud. About 90 percent of the workloads in Bridgestone's data center are virtualized, Olds said. The facility has 3,000 physical and virtual servers. Olds said there will be an ongoing need for on-premise data centers. "To me it's a balancing act," he said, and he doesn't see any model that is all-cloud or on-premise. The cloud is a complementary service, he said. Bridgestone also built a data center to tier three standards, which means having redundant power feed, generators, power distribution, cooling system and network. The Uptime Institute, an independent advisory group, developed a Tier Classification System and certifies data centers on one to four levels. Bridgestone didn't seek official certification, since "we weren't selling our services, it didn't make sense to spend that money," Hartz said. The renovation allowed Bridgestone to move to an environmentally friendly cooling system. The data center uses outside air cooling for 70 percent of the year. Mechanical cooling is only required once the temperature reaches 70 degrees. In the Mother of all Demos, Engelbart demonstrated the mouse, videoconferencing, copy and paste, windowing and many other technologies. It's hard to imagine what this data center will look like in 2068.